Tipped to be one of the hottest toys for Christmas 2011, the Air Swimmers Remote Control Inflatable Flying Shark has to be seen to be believed! If you want a toy that will get gasps of amazement on Christmas morning and beyond then look no further! 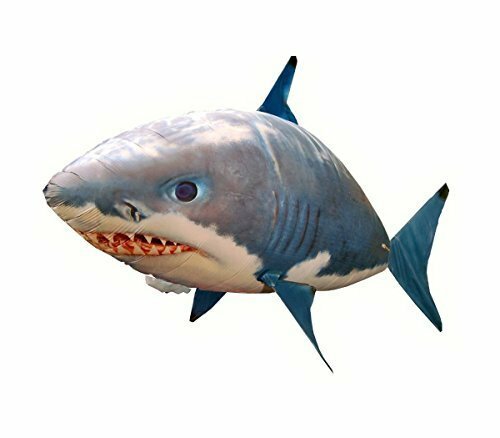 Buy the Air Swimmer Remote Control Inflatable Flying Shark Now! The Air Swimmer Remote Control Inflatable Flying Shark has complete up and down and 360 degree turning motion via the remote control. Filled with helium, the toy runs off 4 AAA batteries. The durable nylon fish body should stay inflated for several weeks, depending on your altitude, and when it needs a top up you can simply refill at any shop selling helium balloons or purchase a helium canister (sold separately). This is an indoor toy and will not work well outside due to air currents and interference with the infra-red remote control. Ideally you want to fly it somewhere with a lot of space and high ceilings, preferably in a public building so you can really freak people out – great for parties! Assembly of the Air Swimmers toys can be a bit tricky so it’s advised if you’re giving this to a child for Christmas, assemble it first or at least be on hand to help out. It is recommended that you view the video available on the web (address included with instructions) so the method of assembly is clearer. It has been recommended by a few people to use glue to attach the fins rather than the supplied tape, as this is more durable. Be warned that this toy will not work if you live at high altitude! Operating the shark can also take a bit of getting used to. You first need to use the supplied putty to make sure the Air Swimmers shark is stable in the air. You then need to flap the tail back and forth to make the shark move forward. There are also up and down buttons which will work when the shark has some forward momentum. All in all this is a really unique and fun toy for older children and teenagers (or adults!) that is sure to impress their friends and keep them entertained. Would also make a great office mascot! The installation was easy and uncomplicated, but in time to put to work the engine does not work. Lost money!